I am surprised that I was unaware of this book for so many years. This book is considered one of the quintessential pieces of nature writing. Though the natural world is a great passion of mine, and in retrospect- some of the books I own reference The Outermost House, I had never picked up a copy until a week ago. The subject is unassuming, and simple: A year spent on the great beach of Cape Cod. The author indeed did not set out to write a book, but merely wanted to take a short two week vacation in his newly constructed beach house. This turned into a solitary adventure that would forever mark his literary career. Henry Beston has a way of wording a sentence that leaves it marked in the mind long after the book is closed. His descriptions are not laboriously detailed, even sparse at times, but he artfully gives exactly he information needed to render the scene on the imagination. It was a pleasant book to read, and though written in the mid 1920s, the English was not archaic or dated. I finished it in a little over 2 days of sparse reading. Only Beston could write an entire chapter just about the sound of the surf on the sand, and not come off as strained. I could almost hear it for myself. 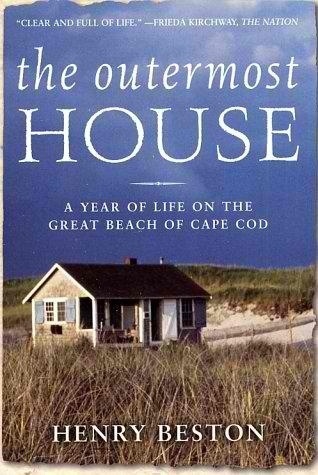 This is a true classic and ‘The Outermost House’ should be on the ‘read next’ list for anyone who loves nature and the feel of the sand between the toes.